Plenty of blogs out there — including Speakers in Code! 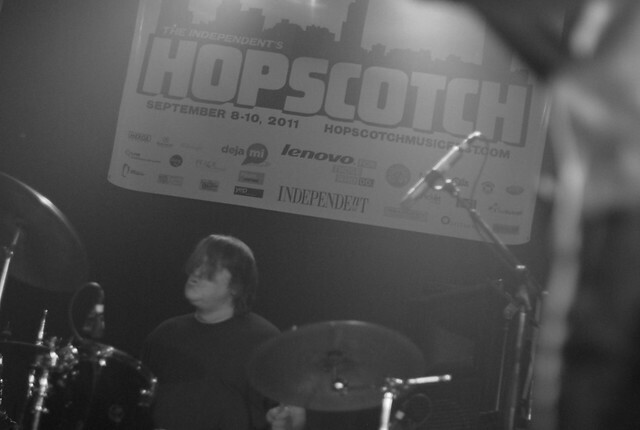 — will tell you which national acts to catch at Hopscotch. For you, my dear readers, I shall tell out-of-towners and Triangle-residents-who-only-leave-the-house-once-a-year which locals are worth their salt, your time, and more, like who pays for photo jobs in vinyl. Aren’t those the important things? Airstrip: Matt Park used to make air-fluff synth-drums groove with Ginger Wagg in Veelee, and now he makes crazy intense dark guitar rock with Airstrip. He is also the namesake of the Matt Park Hangover, where you might still be drunk 24 hours after you started drinking, or possible just still deathly hungover at nightfall the day after your extravaganza, or simultaneously drunk and hungover, because Matt Park is amazing. Calico Haunts: call it Americana, but that’s simplifying what Alexander Holt Iglehart does. It’s complex and angular Americana, nothing that can be pinned down to a single region but something bigger than all of the tradition that’s come before it. Curtis Eller: the World’s Greatest Yodeling Banjo Player, who can also do some fantastically spectacular high kicks. Eller is a treat to watch, a joy to shoot, and one of the most clever satirical songwriters I’ve had the pleasure of knowing. Flesh Wounds: don’t stand too close to the stage or frontman Montgomery Morris might accidentally take your head off with his guitar, but if I’m going to DIE in pursuit of a great photo, I’m going to go to the soundtrack of Flesh Wounds’ driving, shambling punk. Gross Ghost: the best ’60s garage pop band in the Triangle, one of the most consistently entertaining Triangle musician Twitters, and Mike always thinks I shoot him from angles that make him look fat. But Brer Rabbit is the real deal when it comes to gorgeous full-length records, and Gross Ghost is a can’t miss. J Kutchma & the Five Fifths: yeah? Yeah. Lilac Shadows: last year I had the pleasure of spending some time in the studio with these guys, and their delicately complex, shimmering indie rock is vastly underrated in the Triangle scene. Phil Cook & His Feat: the bluesy, heartwrenching side project of Megafaun mastermind Phil Cook, his solo incarnation is literally Phil, some instruments with strings, and a bunch of stompy things that make percussive noises. Except that “literally” or “simply” just doesn’t cut it for describing his songs, which might be the stripped down flip side of Calico Haunts’ outsized Americana. Some Army: Some Army are the Pavement of the modern Triangle scene. This is the highest compliment I can give. Also, once Russ paid me for photos in vinyl. The Beast: one of the Triangle’s best hip hop groups, don’t miss Pierce Freelon and his compatriots if you can help it. The Future Kings Of Nowhere: In the last few years, Shayne Miel has beaten cancer, released an EP about pirates, fathered a set of twins, and he writes some of the most ear-worming pop punk songs, in the best possible way, in the Triangle. What can’t the man do? Go see him at Hopscotch and find out if there’s anything. Of course, these aren’t the only great locals playing Hopscotch — a ton of my favorites are only playing day parties (SPIDER BAGS SPIDER BAGS SPIDER BAGS ALSO LAST YEAR’S MEN AND SPIDER BAGS), not the official evening lineup, and some of the locals in the evening lineup I’ve never seen and can’t speak to personally, just heard good things. Any exclusions aren’t personal, just either absent-mindedness or … absent-mindedness. No hard feelings! I can recommend every single day party — Triangle Music has a great spreadsheet of all of them available here — but personally I’m most excited about Churchkey’s Friday party at Slim’s; that’s probably where you’ll be most likely to run me to ground during Hopscotch without great work.